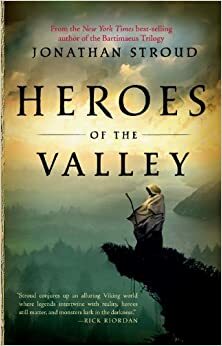 Heroes Of The Valley by Jonathan Stroud. This cleverly written story is set in the ancient Viking world. Halli seveinsson is the youngest in the seveinsson family.His older brother Leif gets the attention because he is the heir to the throne.His older sister gets the left over attention because she is the prettiest girl in Seveinsson house. Halli doesn’t get barely any attention and it doesn’t help that Halli isn’t the most attractive boy either.Which leaves him a little too much time in his hands. There are 12 Houses one for each of the founding heroes.The founding heroes rid the valley of an evil spices(trows) that prey on us humans when we least expected it.Ever since the trows were rid from the valley the ancestors of the heroes have kept the legends of the heroes going. TEEN RATING: ‘A cleverly crafted book’. 3/5 . 12+.